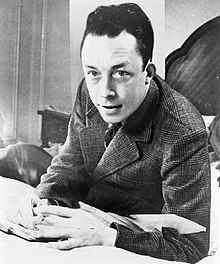 Because he was not a partisan in the Cold War between the U.S./NATO and the U.S.S.R, Albert Camus was an oddball. As a result, he was criticized by the right, left, and center. His allegiance was to truth, not ideologies. He opposed state murder, terrorism, and warfare from all quarters. An artistic anarchist with a passionate spiritual hunger, an austere and moral Don Juan, this sensual man of conscience and honor earned his reputation by a lifelong literary meditation on death in all its guises: disease(he was constantly threatened by tuberculosis), murder, suicide, capital punishment, war, etc. ; deaths both “happy” and absurd, sudden and slow. His enemy was always injustice and those powerful ones who thought they had the right to make others suffer and die for their perverted purposes. An artist compelled by history to enter the political arena, he spoke out in defense of the poor, oppressed, and powerless. Among his enemies were liberal imperialism and Soviet Marxism, abstract ideologies used to enslave and murder people around the world. But in 2013 Catelli published a book on the case, Camus deve morire (Camus Must Die), that, oddly enough considering its explosive claims, has not been published in English (or French, as far as I know).I have recently read an English translation kindly provided to me by Catelli, and while I am still studying and researching his thesis, I will say that there may be more to it than those early dismissals of the Corriere della Sera report indicate. One has only to harken back to the 2013 mysterious death of journalist Michael Hastings in the United States when his car accelerated to over 100 miles per hour and exploded against a tree on a straight road in Los Angeles to make one think twice, maybe more. Tree lined straight roads, no traffic, outspoken writers, anomalous crashes, and different countries and eras – tales to make on wonder. And probe and research if one is so inclined. Whatever the cause of Albert Camus’ death, however, it is clear that we could use his voice today. I believe we should honor and remember him on this day that he died, for as an artist of his time, an artist for our time and all time, he tried to serve both beauty and suffering, to defend the innocent in this murderous world. Quintessentially a man of his age, he was haunted by images that haunt us still, in particular those of being locked in an absurd prison threatened by madmen brandishing weapons small and large, ready to blow this beautiful world to smithereens with weapons conjured out of their hubristic,́ Promethean dreams of conquest. This world as a prison is a metaphor that has a long and popular tradition. In the past hundred or more years, however, with the secularization of Western culture and the perceived withdrawal of God, the doors of this prison have shut upon the popular imagination, with growing numbers of people feeling trapped in an alien universe, no longer able to bridge the gulf between themselves and an absent God. Death, once the open avenue to the free life of eternity, has for many become the symbol of the absurdity of existence and the futility of escape. Camus was haunted by these images, intensified as they were by a life of personal isolation beginning with the death of his father in World War I when he was a year old and continuing throughout his upbringing by a half-deaf, emotionally sterile mother. His entire life, including his tragic art, was an attempt to find a way out of this closed world. That is why he continues to speak today to those who grapple with the same enigmas, those who strive to find hope and faith to defend the defenseless and revel in the glory of living simultaneously. Not absurdly, he left clues to that quest in his briefcase on the road where he died – the unfinished manuscript to his beautiful, posthumously published novel, Le Premier Homme (The First Man). It was as if, whether he died in an accident or was murdered, the first man was going to have the last word.